A sweet eight-year-old approached a volunteer from Target, the awaiting youngster being handed the first of 2,000 free backpacks the company had generously donated to Mission District schoolchildren. The child’s face was aglow as she rifled through the supplies in the backpack–her backpack. “Gracias. Thank you,” the grateful child sheepishly stated, cognizant that she was now prepared for the upcoming school year. The student’s parent, who asked to remain nameless because of the dire financial situation that led her to be one of the first in line at John O’Connell High School for today’s free event, was equally grateful. She had arrived at 7:30am for the 10am event, just to ensure her daughter had what she needed to achieve this upcoming school year. “Gracias por la mochila. 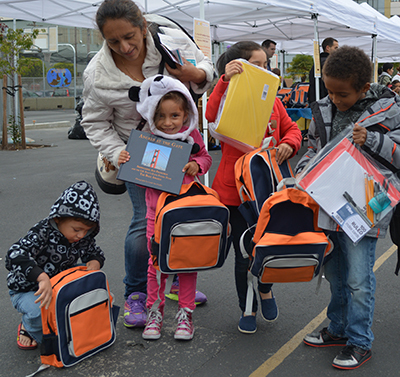 Muchas gracias,” echoed the mother as she thanked the volunteer for the free backpack, and then grasped her daughter’s hand as they walked inside to partake of the rest of the Mission Promise Neighborhood (MPN) activities. School supplies fall down the list when you are trying to pay ever-escalating Mission rents and need to put food on the table every night. The reality is that around $28K a year–the average household income of MPN families, as determined by a recent Family Climate Survey–does not go very far these days in San Francisco. Especially if you are a single mother. Especially if you are an immigrant. There were still 1,999 backpacks left to distribute to the anticipatory queue, snaking around three blocks for the first part of the 3-in-1 “Back to School Event.” This portion was made possible via the support of the San Francisco’s Mayor’s Office, Kindergarten 2 College, Walgreens, and Comcast, with Target donating the backpacks. These backpacks had been stuffed with school supplies over the past few days. A bevy of volunteers from Google, LinkedIn, Deloitte Consulting and others was pieced together by MEDA to undertake this Herculean task. Some volunteers were long-time neighborhood residents. Some were newcomers to the Mission or even lived elsewhere in the Bay Area. Regardless, they all selflessly chose to give back to the community. At 11am, speakers took to the podium, with MEDA’s rousing Mattias Kraemer emceeing. The throng, which at this point packed the corridors to the max, was first welcomed by MEDA Executive Director Luis Granados, followed by District 9 Supervisor David Campos (pictured). The speakers continued, with sponsors of the event being given the chance to put forth their message. By the time this part of the day’s event was concluded at 11:45am, all 2,000 backpacks had been given out—quite the feat. There was still much going on for the rest of the afternoon. 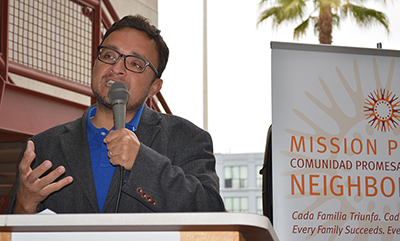 MEDA’s third “Get Connected!” event, presented by Google, LinkedIn and the California Emerging Technology Fund, was held as a vital second part of the day, with the goal of continuing to bridge the digital divide in the Mission. Despite the neighborhood being action-central for the next greatest thing in tech, there are still residents who do not have an email. Yes, in 2014. “There are issues regarding cost and relevancy. It can cost on average $65 a month to have high-speed internet in the home. And with two-thirds of our clients being immigrants, they may not see tech as being relevant to their lives. Our recent Family Climate Survey confirmed that 23% of MPN students do not have access to high-speed internet and a computing device in their home,” explained MEDA Technology Manager Richard Abisla. MEDA deals daily with these two issues at Plaza Adelante, its neighborhood center. Today, the solution to that challenging issue was brought directly to MPN families. MEDA Broadband Coach Erica Castillo’s table was abuzz with activity, as she counseled people on deals to obtain low-cost internet at home. Castillo explained that anyone whose child qualifies for free or low-cost lunch in school can partake in a program that is currently six months free and just $9.95 per month thereafter. An added plus: the first 50 people signing up today received a Nexus 7 tablet, generously donated by Google, so MPN families would actually have a personal computing device for their home. By day’s end, there were 50 Mission residents who had signed up and were booting up their gleaming, new devices. To deal with the relevancy issue, a cadre of tech volunteers offered to spend their Saturday teaching digital-literacy workshops. Some of these classes started with the basics, such as the fundamentals of using social media. Yes, in 2014. All participants of the 21 workshops were eligible to enter a raffle to win other Google-donated Nexus 7 tablets. 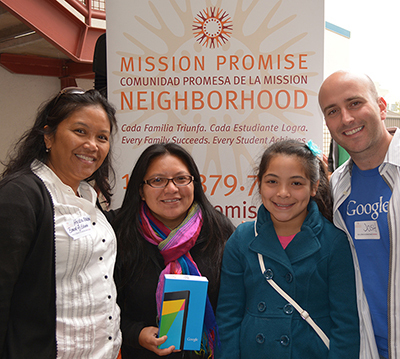 Google also sent a number of volunteers to help Mission families. LinkedIn employees did the same, the tech world banding together for a good cause. To inspire the crowd, a Latino Career Panel was convened, with power players from the tech industry. Kim-Mai Cutler, a reporter for the popular online site TechCrunch, moderated the discussion with her usual panache. As panelists’ stories were revealed, the crowd realized there was a place at the table for them in the tech world. Connections were made today–in more ways than one. Attendees of today’s event got to see the power of community partnering. After all, it’s not easy making sure that every family succeeds and every student achieves at four of the poorest-performing schools in San Francisco. 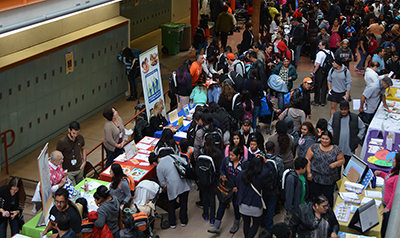 That’s why MEDA initially rounded up over a score of neighborhood agencies to win this long-term battle, with many of these partners coming out in force today as part three of this back-to-school event. Some of these nonprofits were tabling, availing financially challenged Mission residents of the resources that can better their lives. Other partners presented workshops on the same subject. It was all about helping people rise up. “I am glad to know that there is so much available for my family. I never knew there were so many agencies willing to help,” stated Mission resident Lydia as she clasped a grouping of brochures. It takes a community effort to make a far-reaching program, such as the Mission Promise Neighborhood, a success. It takes partners. It takes everyone in a community feeling they have a stake. It takes a village–and today that village was called the Mission.